This is the story of a dedicated and concerned volunteer working with Door Step School children in Pune. Sharmishtha Deshpande from Wipro started volunteering from June 2015 at construction sites and brick kilns in Kondhwa area. She was teaching a group of around 15 children between 6 and 13 years of age. Many of the children attended nearby government school till 3:30 in the afternoon and joined Sharmishtha Tai's class from 3:45 till 5:30 in the evening. Sharmishtha wanted to teach these children English. She used simple methods like teaching them how to spell their own names and addresses. She introduced them to colours and numbers in English. Then she proceeded to teach them other English words and made the learning process interesting by adding drawing and painting activities. A specific room was not available at the location for Sharmishtha to conduct her class. There was a vacant room in the labour vasti, which was initially used as a classroom. But the class was scheduled to happen only once in a week, on Saturday. This room would usually get occupied during the week by some new labourers joining the construction work here. But Sharmishtha was very determined and she would conduct her class anywhere she found a place to sit with the children. 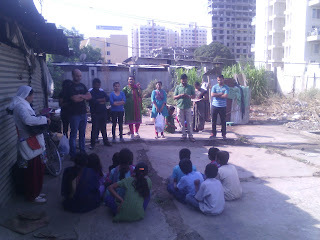 There were times when she conducted her class even in the shadow of nearby houses. She never complained about uncleanliness of the surroundings or state of the children. She also arranged all the required teaching aids on her own. Although some mats and slates were provided at the site, those were frequently stolen and misplaced due to lack of storage space. Sharmishtha gave beautiful pictures to the children and got them painted. Once the painting was done, she collected all the pictures and got them laminated. She was always against rejecting any of the pictures for not being painted well. She didn't want any of the children feel bad for their picture not being selected for lamination. So involved she was with the children that she could not think of seeing them sad. While conducting the class, Sharmishtha noticed uncleanliness of the surroundings and decided to run a cleanliness drive. Next Saturday, she herself brought 10 volunteers with her at 8:30 in the morning and got the entire area cleaned. Looking at the enthusiasm and initiative of volunteers, even the builder of the construction site sent two labourers to help volunteers clean the area. The volunteers then planted trees in the premises. Children at the site were involved in all these activities and now they have taken ownership of the trees and are seen taking good care of them. 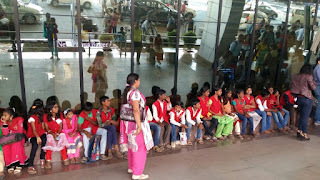 One day, Sharmishtha proposed to take these children on a tour to Lohegaon Airport. Neither the children nor their parents had ever visited any airport. All of them were too excited about the trip. 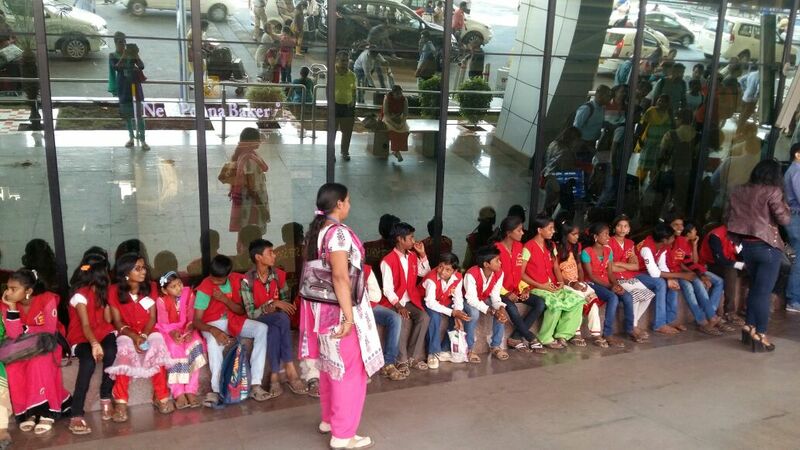 A total of 42 children from various construction sites in Kondhwa, Undri, and Pisoli were taken to Lohegaon Airport. The volunteers guided the children through various sections of the airport and answered their never-ending questions. It was truly a lifetime experience for the children. The children are very much fond of their Sharmishtha Tai, who not only helped them in their studies but also gave them life lessons of cleanliness and nature conservation. 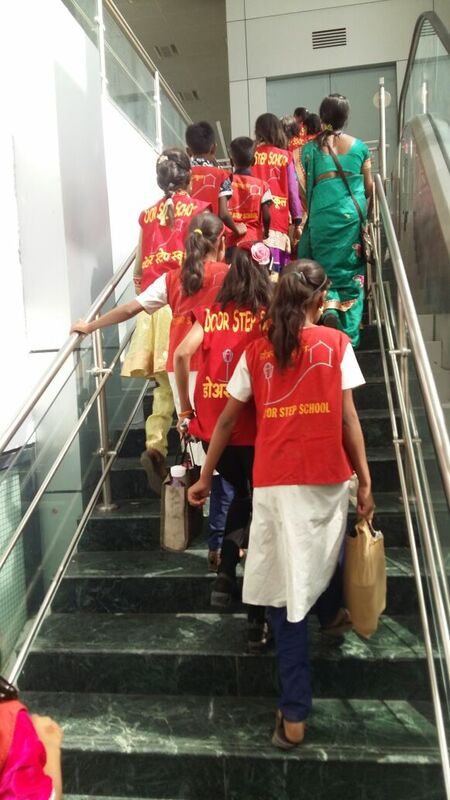 On behalf of all these children, Door Step School would like to thank Sharmishtha and her group of volunteers for bringing hope in the lives of these marginalised children.